We are thrilled to welcome new staff member Olivia to Green Ivy! Olivia is a graduate of Stanford University, where she spend considerable time tutoring at East Palo Alto Tennis and Tutoring, working at a local free clinic and volunteering as an EMT. 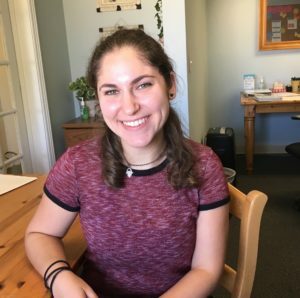 Olivia works with students on upper level math, science, history and writing, as well as test preparation and general organization. Outside of work, Olivia likes reading and writing poetry, listening to musical theater soundtracks, and drinking lots of coffee. What is one thing about you that no one could guess just by looking at you? As a kid, I really liked hula hooping and got pretty good at it! At one point I could do it with 10 hula hoops at once. Who is your most significant role model and why? I am really inspired by my mom’s work ethic and commitment to helping others. She takes care of my brothers and me, works as an Occupational Therapist, and started a baking business. Even thought she’s busy, she always makes time for the people in her life. I strive to be as caring, passionate, and hardworking as she is. What is one new thing you want to learn this year and why? I would love to learn a new language! I find languages really fascinating and I know that they are tremendously important for building cultural awareness. I took French in high school but I may try to learn Spanish or German. I spend a lot of my free time in coffee shops, where I drink coffee while I read or write. I really like poetry and I am trying to write poems on a regular basis rather than only writing when I’m inspired by a particular event or emotion. Students remind me how important the qualities of honesty, fairness, and optimism are. I also love thinking through solutions to challenges and celebrating successes with them.